Browse: Home / 2019 / March / 26 / Were Marciano and Walcott’s Two Title Fights an Upset and Set-up? The legendary heavyweight champion Rocky “The Brockton Blockbuster” Marciano had 42 fights with the last one an eliminator bout before getting a shot at the world title. That was quite a few fights when you realize 1956 Olympic Gold Medalist Pete Rademacher got a world title fight in his debut being knockout out in 6 rounds by Champion Floyd Patterson. Then later 1976 Olympic Gold Medalist “Neon” Leon Spinks got a title fight in his 7th fight winning a split decision over 15 rounds from Champion Muhammad Ali. 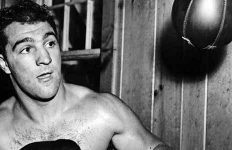 Marciano had stoppage wins over Rex Layne, 34-1-2, former world champion Joe “The Brown Bomber” Louis, 66-2, Lee “The Battling Bartender” Savold, 104-45-4, and Bernie Reynolds, 52-9-1. Then in the eliminator a knockout of Harry “Kid” Matthews, 81-3-5, in 2 rounds. The 29 year-old Marciano, 42-0, then was to face champion Walcott, 51-16-1, who was 38 on September 23, 1952. Walcott had two failed title shots with Louis, losing a controversial split decision and getting knocked out in 11 rounds. A year later he lost to Ezzard “The Cincinnati Cobra” Charles for the NBA title. Even though in his next fight he lost to Rex Layne he still got the title shot. Layne would have 8 wins in 8 months after defeating Walcott before he got a title fight with Marciano getting knocked out in 6 rounds. On that night at Municipal Stadium in Philadelphia, PA, Marciano was behind on the scorecards after 12 rounds by scores of referee Charley Daggert 7-4, judge’s Pete Tomasco 7-5 and Zach Clayton 8-4. In that 13th round Marciano would score a crushing knockout over Walcott to win the world heavyweight title. That right hand knocking out Walcott was one of memory as the face of Walcott was bent out of shape. This was quite an “upset” by Marciano. 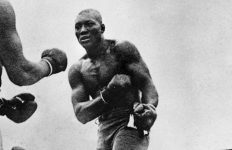 This writer was told years later by boxer-referee, Hank Cisco who was in the dressing room where Walcott lay he overheard the ring physician refer to Walcott and say “this man should never fight again”. Seems Walcott had a bone broken below his left eye and if hit there again he could be knocked out. The mob had control of Walcott and obviously knew what the ring physician said. But being Walcott was ahead after 12 rounds he deserved a title fight though ill advised. I imagine they put quite a bit betting money on Marciano knowing his chances of winning were a sure shot. It would close to 8 months before the rematch was made on May 15th, 1953. As figured Marciano would score a first round knockout in 2:25 at the Chicago Stadium, in Chicago, IL. Referee Frank Sikora could have counted to 100. This was the “set-up” with Walcott’s people knowing ahead of time what the result would be. Walcott would never fight again. Marciano would defend his title 6 times including the Walcott rematch scoring wins over Roland LaStarza, 53-3, TKO 11, in Ring Magazine’s “Fight of the Year”. Then he would decision former champion Charles over 15 rounds. In a rematch with Marciano’s nose being severely cut and in danger of being stopped he knocked out Charles in the 8th round. He would then go onto stop the 10 fight winning streak of Commonwealth (British Empire) Champion Don Cockell, 66-11-1, in the 9th round. On September 21st, 1955 Marciano would make his sixth and final defense stopping the 21 fight winning streak of Light Heavyweight Champion Archie “Old Mongoose” Moore, 149-19-8, coming off the canvas in the second round to score four knockdowns with the final one a knockout in the 9th round ending his record at 49-0 (43).